I can’t remember how I found out about Saving Money Plan www.savingmoneyplan.com but I’m really glad I signed up to receive the daily newsletters because I’ve saved money with coupons I’ve seen in the newsletter, found out about free stuff (you know I love both of those things!) and learned more about how to find and use coupons. I thought it was about time I shared this valuable site with you and decided to go straight to its founder, Claire Williams for all the inside information. Budget Smart Girl (BSG)-For the readers who don’t know about the site can you tell them what Saving Money Plan is all about? Claire Williams (CW)-Saving Money Plan encourages you to live better with practical money-saving strategies and daily deals. CW-I launched it in 2008 but I wish I had started sooner. BSG-How did it come about? CW-I had been reading so many deal blogs online and realized that I not only loved reading them, but I also wanted to write one! The fact that I had always been known among friends and family as being the one who knew how to save a buck was clearly an added plus! BSG-How do you find all the great deals? CW-I’m on lots of newsletters, I have great bloggy friends with whom I share deals, and I read – read – read! BSG- Is this a full time job for you? CW-It’s a hobby for me – a part-time job you could say. BSG-You send out an e-mail newsletter every day for anyone who signs up, what can readers expect to find in their e-mail box every day? CW-Great deals, lots of coupons, and the specific advice you need to actually use the deals to get tons of free items every week – especially from your local drugstores. The thing readers really like about Saving Money Plan is the free coupon class – as it teaches you to get hundreds of dollars in free items every month. A few years ago I never thought you could really do this, but you definitely can and I do! BSG-Any money saving tips you’d like to share with us? CW-Learn the drugstore game! It is one of the best ways to save $3,000 of your household budget this year! And it’s fun! I teach a free coupon class to learn it, but many others write blogs about it as well! BSG-Can you tell us about some good deals you’ve found in the last week or so? CW-The holidays are a great time to score deals. This past month I picked up over $90 in free items one week from Rite Aid – that was great. It was totally free. BSG-Any sites you’d recommend we check out for more good deals. CW-I love Censtable Momma www.centsablemomma.com and Money Saving Methods www.moneysavingmethods.com I would really recommend those two! BSG-Anything else you’d like to share? I found out last week that the Budget Smart Girl’s annual holiday gift guide was named one of the best budget and green guides by Blogs.com. As the guide seems to be a popular feature, next week I’ll be featuring a Valentine’s Gift Guide…I’m already getting e-mails with lots of great and bargain priced products and yes, another giveaway for you. Someone who I’m really looking forward to chatting with at Budget Smart Girl is Danny Kofke. He’s written a book about surviving on a teacher’s salary which is full of tips we all can use to stretch our budgets. Some of you might have seen him last week on Fox TV where he was a guest on the morning show. Just in case you missed it, here’s a link. I’ll be interviewing Danny in March and posting the interview on the site, so if any of you have a question you’d like me to ask him, just e-mail me. The Aerogarden is doing well. I removed the dome covers a few days ago. Here’s a photo of its progress. This week on Budget Smart Girl, the first newsletter of the year and I’ll tell you about a Web site and newsletter you won’t want to miss. I know cleaning products won’t break the bank but I’ve been using everyday products like baking soda and vinegar for years. It not only saves money but I no longer get headaches from all the chemicals used in commercial products. 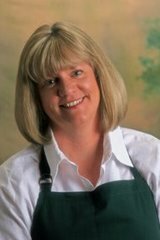 I’m always looking for green cleaning tips that save money so I asked Leslie Reichert, a certified green cleaner and author of The Joy of Green Cleaning to offer some advice. Budget Smart Girl (BSG)-What ingredients/products would you recommend everyone have on hand? White vinegar, baking soda, lemon juice and salt. Along with those you can also use castile soap, borax and find an essential oil that you like – just for the scent. I like peppermint this time of year and I change with the seasons. BSG-I’m guilty of this one, using too many paper towels while I’m cleaning. Any greener…and cheaper alternatives? BSG-Any brands that are eco friendly and low cost? LR-Since I’ve switched to the Skoy cloth and microfiber cloths (great for cleaning glass and stainless steel) I only buy paper towels by the single roll and they last forever. I look for recycled paper and no bleach in my paper towels. Seventh Generation makes some. BSG-One product I hate using is oven cleaner, anything less toxic? LR-Here is a trick from my book. Sprinkle the bottom of the oven with baking soda. Spray it with water and keep it so the baking soda stays very damp. Let it sit over night. When you are ready to clean, spray white vinegar on the top of the baking soda and let it foam up. Then just wipe everything away. You can also make a paste of baking soda and water to wipe on the sides of the oven. You follow the same instructions as above and you end up with a sparkling clean oven! BSG-I’ve been using a homemade recipe for the dishwasher, but I noticed it’s leaving white marks on the glassware, anything to counteract it? LR-Try using lemon juice in the rinse. The white marks are probably a mineral build up from the water and the lemon juice will work to break it down since it’s a natural acid. BSG-What are some of the best budget friendly cleaning recipes? All it takes is 1/2 cup table salt, 1/2 cup borax, and 1/2 cup baking soda. I add 10 drops of lemongrass essential oils (just for a scent) and you can use this mixture to scrub you sinks, toilets and even your porcelain tubs. It will take the place of your sink scrub, your toilet bowl cleaner and the tub scrub. BSG-Some readers might like to buy things like baking soda and vinegar in bulk or larger sizes, do you know of any companies that offer these super sizes? LR-I’ve seen large boxes of baking soda in the laundry section of grocery stores. I think it’s is around 5 pounds. The biggest container I’ve seen for vinegar is a gallon, but maybe if you go to a restaurant supply company you would find larger sizes. I like my vinegar in the gallon so I can leave it underneath my sink and it’s easy to manage. BSG-What about green washing powder? Would you recommend people make their own? BSG-How about stainless steel or chrome, lots of the products that work the best are really toxic. Any greener products to get a shine on fixtures? LR-Oh my favorite is an E-cloth. This is a high grade microfiber cloth that only uses water. It will leave your stainless sparkling with NO CHEMICALS! It is truly amazing. I give this cloth to my son (11) and he can clean everything in my kitchen and never makes a mess. You have got to try it! BSG-Any other hints or tips you can offer? The Blog-Are Prices Going Up? Have you noticed food prices have crept up since the holidays? I was just checking out the local supermarket flyer and noticed what used to be buy 2 for $4 is 2 now $5 or 6. Glad I stocked up during the holidays. One of things on my to do list this year is to check out Aldi supermarkets. I know I’ve been saying this for over a year, but one of these days I’m really going to shop there. 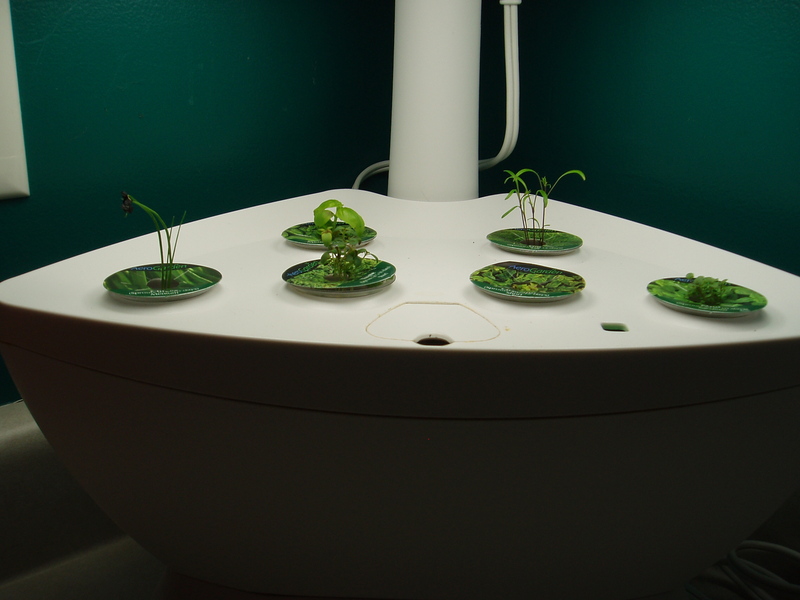 If you’re wondering how the Aerogarden is going… a few days ago I noticed the first shoots starting to appear. The basil seems to be growing the fastest. I’m already thinking about how I’ll use the first harvest. (I’ll post more photos next week). On my must do list for this week is putting together menu and shopping lists for the week, even two weeks at a time. In fact, that will be one of the topics on this week’s Budget Smart Girl. I’ve got so many projects going right now, I’m looking for easy dinner (and yes, budget friendly) ideas that will free up some time. Also, on the site this week, I ‘chat’ with a green cleaning expert about ways to save money on cleaning your home. Isn’t it ironic that most of us make a resolution to get in shape in the dead of winter and too cold to exercise outside? Maybe that’s one of the reasons memberships to health club soars in January. Paying to join a club or buying expensive exercise equipment isn’t the only way to get and stay in shape these days. I did some searching and here are some sites and resources I found. Where I live there’s everything from community education classes for Pilates to yoga. There’s also a community center that offers low cost classes and membership that’s half the price of a health club. And not to mention mall walking groups. I’m guessing that if there isn’t a ton of them already on sale there now, most auction sites will be overflowing with exercise equipment by the time March rolls around. Why? Most people can’t stick to their resolution and end up selling it or throwing it in their basements. That’s brings up another tip, wait until spring and I’ll bet garage sales have some good buys too. Like I always say, it’s bad luck for a business when it closes its doors but always good luck for us. I’ve seen no end of fitness clubs going out of business since the recession started and sometimes they sell equipment. Not always things like treadmills, but small items like weights, mats etc. Cheap enough to make an investment…even if you don’t use them, and small enough to fit under the bed. I know it seems strange that your computer can be the best resource for cheap workouts but I found these sites. I haven’t given any a test drive so I can’t vouch for them and as always proceed with caution. Another thing that the recession has brought in our favor is that more businesses are willing to negotiate a price rather then lose a customer. If you have a health club membership and think it’s getting too costly, why not ask them if they can give you a better deal or even drop some services that you’re not using. And if you really feel joining a club is the only way you’re going to stick with your exercise plan, see if they can lower the cost or at least waiver the enrollment fee. I rarely rave about something but my husband bought me a Wii for Christmas. I didn’t think something that was so fun could get you in shape but it can. I have the Wii Fitness Plus and love it. Okay, the whole thing isn’t cheap but it’s an investment, you never have to leave home, and you can add to it as your budget allows. It weighs you, gives you your BMI, sets goals for you and yes, even gently scolds you when you’ve missed a day or two! I’ve been impressed with my results. I’ve lost some weight, improved my balance and flexibility and had fun at the same time. And yes, it’s a real workout because yesterday muscles that I didn’t know I had were sore. And just today I read that Nintendo is teaming up with Netflix, so for $9 a month and a broadband connection, you’ll soon be able to watch movies on it. And with cable TV prices set to increase, this might be a good alternative. They’re sold in packs of four and help train the whole family as to what a normal portion size should be. Tracy kindly sent me some bowls and now I fill them with things like popcorn or trail mix when I need a quick snack while working. Here are Tracy’s tips. As a lover of all things containing sugar, I know the challenges of healthy eating. Yet over the years, three major eating tips have helped me stay slim – while enjoying the things I love to eat most. These tips are great for maintaining good health, monitoring your weight, and saving yourself a few dollars too. 1. The food rule that can change your life: “The further a food gets from the way nature hands it to you, the less of it you should eat.” Make this your shopping mantra and you can’t help but fill your kitchen with the food your body needs. Ever seen a pretzel tree? Watched someone milk a soy plant? Or harvest a rice-cake? Of course not! Those hard to resist foods that are processed beyond recognition should have a small place in your diet. 2. Moderation: Try not to label foods as ‘good’ or ‘bad’. How we think about food can play an important role in our eating habits.With that in mind, I have always allowed myself to view food as a simple pleasure and have enjoyed all foods in moderation. 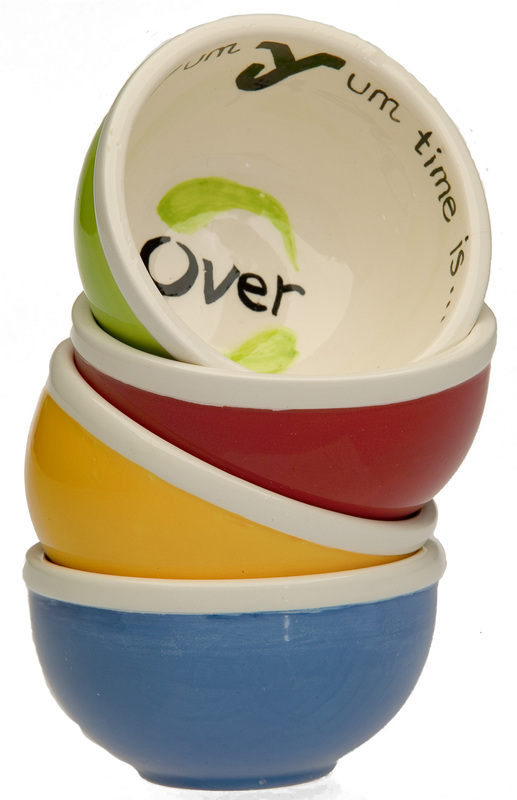 High calorie, high fat foods (processed or not) are eaten in small quantities, most recently in a Yum Yum Dish – a 4oz ceramic dish that helps remind me when ‘enough is enough’. 3.Tend the fire in your tummy: Too few people give their digestive fire enough – if any – consideration. Although your stomach works 24/7 and performs vital and amazing tasks such as digestion and nutrient extraction… it often receives little assistance or attention from its task-master. I think of my stomach as a little camp fire. If I throw too much wood (food) on it all at once, I know I’ll smother it. Calories that don’t burn up in the fire turn to fat so I make sure my fire is burning strong by doing two things. I constantly work to slow down and be fully aware when I’m eating. And instead of eating 3 times a day, I eat 5 or 6 smaller meals throughout the day. There are health as well as economic advantages to changing your eating habits. The cost of eating healthier foods can be offset by reducing the purchase of processed foods. Processed foods that do make their way into your kitchen will last longer if eaten in moderation, over a period of time. Think how long a half gallon of ice cream would last if you were eating a 4oz portion just a few times a week! With a health care crisis facing America, it is imperative that we become more preventive in our approach to good health. Our choices will affect our quality of life as well as our long-term health care costs. Challenge yourself to develop some new eating habits in 2010. Adopt a few of the tips above or continue to research the food and lifestyle choices that are best for your body type. Good luck! And above all else, enjoy! Some great ideas and here are a few ideas I’ve used to keep snacking at a minimum and keep it healthy…and low cost. The prepackaged, 100 calorie treats are everywhere these days, but you can save money by making your own bags or even use something like Tracy’s Yum Yum dishes. Buy a regular size bag of crackers, chips etc, and divide them into smaller portions and put them in storage bags. I’ve done this with things like trail mix and then put the bags in a basket in the pantry which brings me to tip number 2. It’s inevitable you’re going to get hungry and go looking for something to eat. However, if you have something healthy on hand, you’re less likely to reach for the tub of ice cream sitting in the freezer. Plan ahead and think of ideas for snacks when you make your grocery list each week. I keep things like whole wheat crackers, nuts, trail mix, string cheese etc on hand all the time. They really are the best snack for your money. And everyone’s got their favorites. Even children like things like bananas, kiwis, and tropical fruits like mangoes that are on sale this time of the year. Even canned fruits are better than candy and oftentimes cheaper too. Here’s a dip I often make in the summer to accompany fruit platters but it’s great in the middle of winter when warm weather seems months away. I’ve even tried replacing the sour cream with yogurt and that works great too. Mix all the ingredients together and serve in a dish surrounded by sliced pineapple, kiwi, strawberries, bananas that have been sprinkled with lemon juice. Or serve a platter of these fruits with a scoop of this mixture in the center. And here’s a tip that’s not food related but helps keep the snacking to a minimum. Most of us eat when we’re bored, so if you’re planning to go on a diet, look for a new hobby. You get so involved in it, learning a new skill that you forget about the odd trip or two to the fridge! Next article…ways to get in shape for less. This year I’m determined to stick with my resolution never to waste food again. I’m usually good about using everything but once in awhile the odd piece of fruit or vegetable heads to the garbage bin. Here are some creative ways I’ve found to use every last piece of food sitting in the fridge or pantry. Hope you can put some to good use. Sometimes I open the fridge and have half a cup of this, half a cup of that…not enough to make a meal but if you combine some foods you get a side dish or the beginnings of dinner. At Christmas I had a about a cup of Potatoes O’Brien leftover from a meal and somewhere between a quarter and half cup of blue cheese. I immediately thought potato salad. I combined the two, added chives, some leftover bacon bits and mayonnaise to make a quick and easy winter potato salad. And here’s something I’m combining all the time these days. Salsa and cheese, which if you’ve never tried them together make for the perfect omelet when you’re short on time. I add oven fries and it’s one of the fastest meals on my desperation dinner list. At Christmas I made homemade cranberry sauce. I seem to be the only person who likes it so I was left with a container of the stuff. I was thinking about freezing it and then I remembered I bought a wedge of brie that was on sale. I’ve seen lots of ways to serve brie and a popular one is to serve it with a chutney or fruit relish. What better holiday appetizer than brie with cranberry sauce. Pairs perfectly. This is often a problem during the summer, too many herbs from the garden. I usually chop them and put them in ice cube trays, but something I’ve been doing recently is adding them to pastry when I make pot pies. Sage is great with turkey and chicken pot pies, dill with tuna pot pies. Chop them up and add them to the mix or even roll the pastry over them a couple of times and they get incorporated into the dough. You can make homemade breadcrumbs but one thing I really like is making bread pudding, which by the way is one of the best bargain deserts. If I have leftover fruit I’ll add that, bananas work really well. And you don’t have to stick with sweet bread puddings, savory ones are money savers too. Roasted vegetables and cheese, cheese and ham… it’s another way to use other leftovers too. When I’m around, leftover mashed potatoes are an oddity. When they are sitting in the fridge, I’ll make salmon fishcakes, Bubble and Squeak or add cheese, roll them in breadcrumbs and sauté them. Children love these, especially if you serve with them ketchup. Another goal I’ve set this year is to use vegetable peelings and scrapes to create my own stock. I have a bag in the freezer and every time I prepare vegetables this bag gets fed instead of the garbage bin. Every couple of weeks, I’ll make homemade stock and freeze it. Best thing is each time you’ll have a different amount and/or combination of vegetables so the stock always taste different. I’ve made crumbles, cobblers and if I really don’t know what to do with the fruit, there’s always a smoothie. These often sit in the fridge and most of the time I buy tortillas and make rice and bean burritos. I freeze them and serve them on days when I don’t have time to cook or for a speedy lunch. This is something I’ve been doing since last summer, using Sundays as a day off from cooking. It’s the perfect time to pull out everything that’s leftover from the week and have a buffet. Eat ‘as is’ or combine what’s left. I’ve had my food saver machine for many years and now there are so many cheaper versions on the market. You can even pick up one at your local supermarket store. If you just can’t think of what to do with leftovers, invest in one of these money saving gadgets and freeze the food until you can. I usually have my New Year resolutions all worked out by the time Christmas rolls around. This holiday, I didn’t. So this week when I’ve had a spare minute or two I’ve been making notes about what I want to achieve this year. Lots of things are on my list and most are about saving money on just about everything, but my top priority is the food budget. Here are some of my goals, they might be yours too. This was on my list last year. I did make some meals now and then but this year I want to be more consistent. Which leads me straight into goal number two. A couple of years ago I bought a cookbook devoted to the subject but never got done to actually putting it into action. I’m determined this year will be different. I’ll spend the first Saturday of each month making meals I can put into the freezer and just pull out when time isn’t my best friend. Yes, I have to admit I buy ready-made pizza crusts and salad dressings. But I have so many great recipes to try; this goal might be doable in 2010. I have a box and some index cards and I’m determined to add all my favorite quick recipes to it. When time’s short or I don’t feel like spending more than 30 minutes in the kitchen, these will be the recipes I pull out. As each year passes, I’ve been using more coupons and searching for bargains. This year I want to do even better. I’ve set a goal of searching online for deals and coupons before each shopping trip. 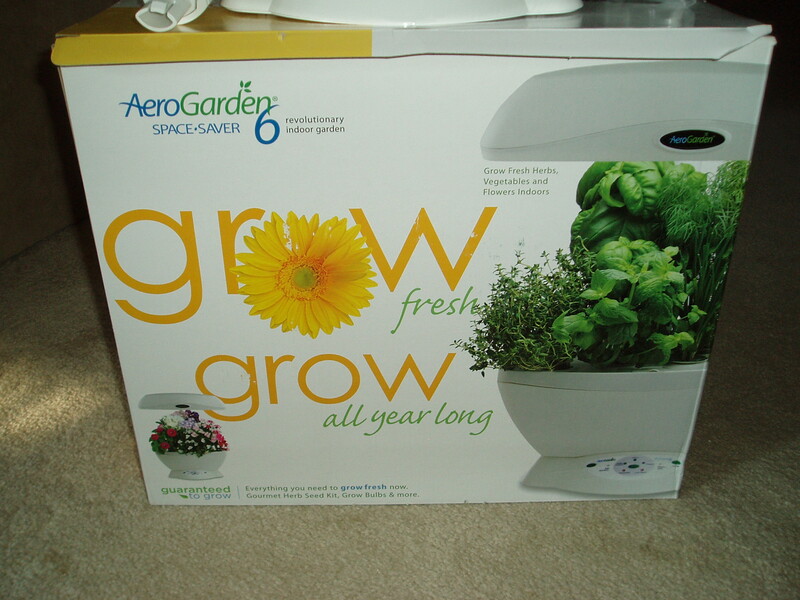 You already know I bought an Aerogarden and I’m planning to plant a vegetable garden in spring. Just the other day I received a gardening catalog selling miniature fruit trees that can be planted in patio pots during warm weather and brought inside in the winter. I might give one a try this year. A couple of things I’ve found help you stick with your resolutions and goals are one, to write them down, two, revisit them on a regular basis, and three, tell others about them and ask them to check on your progress. Here are some Web sites I’ve found that offer free grocery lists, to do lists, just about everything to get more organized and gain more time this year. It’s 2010 and I haven’t made any New Year resolutions yet. Most of will be budget related. One is to finally get my master grocery list finished. I always think it’s done and then I find something else to add to it. Another resolution is to get a vegetable garden planted. That was on my list last year and never seemed to happen. I’ll be getting off to a great start with my Aerogarden. I haven’t got it up and running yet but when I do I’ll let you know how it’s going and post some photos. Another goal is not to throw away any food. I hate doing that but now with prices on the rise again; I’m determined to use everything that sits in the fridge, freezer and pantry. Hopefully, both the garbage and compost bin will be on a diet this year. So what about your resolutions? Did you make any? If any are budget related I hope Budget Smart Girl can help you out this year. Speaking of…this week on the site as I think about how not to waste food, I’ll give you some of my suggestions for using leftovers and combining foods to make new meals. Also, tricks I’ve found to help keep me on budget.